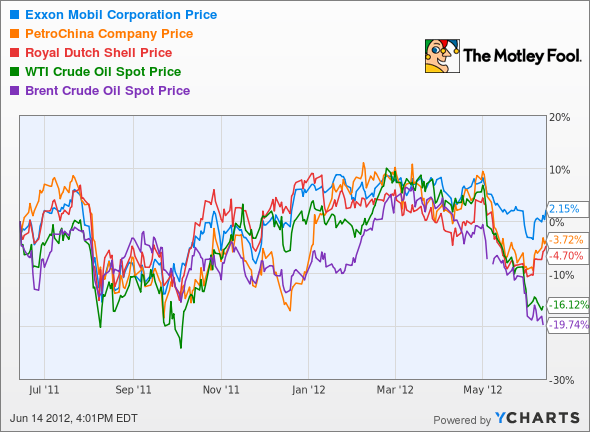 Energy stocks have taken a licking over the past few months as the price of oil dropped. It's a volatile commodity that can be affected by everything from political turmoil overseas to the release of economic data here at home. That's an awful lot to worry about when you own energy stocks. 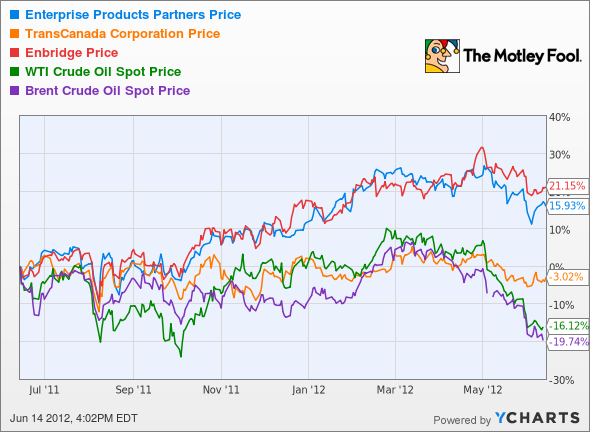 But, as it turns out, the price of oil really doesn't matter when it comes to midstream stocks. There are three charts that make it easy to see just how much better off midstream companies are compared to other energy stocks. First up, the three biggest midstream companies by market cap -- Enterprise Products Partners (NYSE: EPD) , TransCanada (NYSE: TRP) , and Enbridge (NYSE: ENB) -- matched against commodity prices over the past 52 weeks. TransCanada had a rougher go of the past year than either of the other two companies, but still fared better than the performance of our commodities. Next up, comparing the three largest integrated majors by market cap -- ExxonMobil (NYSE: XOM) , PetroChina, and Royal Dutch Shell to the same commodities over the same time period. A quick glance at these two charts and it's easy to see which camp you'd rather be in. Just to hammer home the point, I'm going to throw in one more. Here are the top three independent exploration and production companies by market cap -- Occidental Petroleum (NYSE: OXY) , Canadian Natural Resources, and Anadarko -- facing the same criteria. Despite the pretty colors, we're looking at an ugly chart. For our midstream companies, it doesn't matter if oil is $10 or $100 a barrel. Fee-based contracts determine how much producers will pay pipeline operators. What matters in midstream is volume, and that is something that, at least in North America, is expected to continue to increase over the next 10 years. Essentially, midstream companies have no choice but to grow. Current infrastructure isn't meeting capacity, and oil and gas production in North America is only going to increase. Energy consultancy HIS Cera estimates that tight oil production in the U.S., from places like the Bakken and Eagle Ford shales, will grow from 900,000 barrels per day this year to 2.9 million bpd by 2020. That's equal to half of what the U.S. is currently producing. Then consider the growth of Canada's oil sands. The country could conceivably double production in Alberta to 3 million barrels per day over the course of the next eight years. That oil has to go somewhere. While politicians talk about energy independence, investors should talk about midstream. Oil is the more talked about commodity, always has been and probably always will be, but the American natural gas boom is just as good for the midstream business. 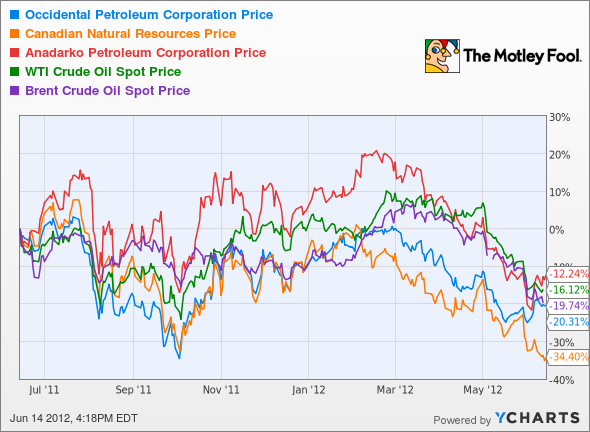 I say the price of oil doesn't matter, but the price of natural gas really doesn't matter. Hovering around the $2.00 mark, the natural gas glut has been a burden to producers and a boon to midstream companies as high volumes of gas flow through their pipelines. Expect that trend to continue as well. The energy industry is expected to spend an estimated $130 billion to $210 billion expanding natural gas infrastructure over the next 20 years. In the near term, 78% of the 8,887 miles of pipeline that are planned for completion in 2012 are for natural gas. Looking further into the future, this trend shifts, as crude and NGL projects increase and gas pipeline projects decrease. I would be remiss if I failed to address the fact that much of this energy is produced in an unconventional manner. Oil that is produced in a more expensive matter, via hydraulic fracturing or from Alberta's oil sands, necessitates a high price to continue production. And in that way, the price of oil does matter to midstream. However, these processes ultimately get cheaper as time goes on as companies become more efficient and technology improves. And, as in many cases with natural gas, it doesn't matter how low the price falls if an operator's leaseholds are held by production. In that case, the oil will flow so that the E&P can hang on to its lease. Many midstream companies are structured as mastered limited partnerships. As such, all of the companies above are set up in a tax-advantaged manner. Profit flows through the company, straight to the unit holder, untaxed. The unit holder is then required to pay taxes on his share of the MLP's income. In the end, it means a little extra paperwork, but it can very much be worth it. That being said, midstream companies are not invincible. They are all still vulnerable to the everyday factors that can ruin a good business: weak management, debt, disasters, and so on, but as far as energy stocks go, midstream companies are tough to beat. Avoiding excessive exposure to volatile commodities and offering tremendous yields, investors should consider midstream for their portfolio. If you are looking for three more ideas, click here for the three stocks Fool analysts deem "The Three Dow Stocks Dividend Investors Need."